I was born in Alabama. My father was stationed there in the navy and I was a navy brat. Our family lived in six different states. When my father got out of the navy, he took a government job working out of Georgia Tech in Atlanta. I was only eleven years old. I have been living in Georgia since then. Because we lived in so many places, I wanted to stick in one place. I was not one of those young people when I started. I was thirty years old and had two young children. Actually, it was my children who wanted to get involved in karate. We looked at the credentials of different schools. Then we met Grandmaster St. James, he was Master St. James then, and we have been with him since we were white belts. I was inspired to start by watching my children. Watching them, I thought I would try it and so I jumped out on the floor. At first, I did martial arts just for exercise. Later, I developed a passion for the martial arts and I fell in love with everything about it. We've been doing martial arts ever since. It has been great growing up together in the martial arts, it has been a great thing for our family, and has kept me close to my children. Q: What inspires you to continue training? Was it difficult to remain inspired over the many years it took to obtain the Master's belt? I have remained inspired through the encouragement of my family. In Grandmaster St. James, I have always had a wonderful instructor who knows how to bring out the best in you. The Grandmaster knows how to inspire you to want to be better. He gave us that passion, and having the same instructor for 15 years has helped us to grow over time. Also, seeing what the martial arts have done for my children and my students - some of whom have been my students for 12 years or more, and so they are like my children - has helped to keep me inspired. I love the way the martial arts bring out a great spirit and makes me feel young. Also, I am a person who loves overcoming obstacles and I am always thinking about goals. The martial arts helps me to set my goals for the next thing. Q: What are your greatest accomplishment in the martial arts? I think it is what I have done for others. The most rewarding thing about the martial arts for me is having students come in, and whatever their obstacles - maybe for adults it is physical health, or for the younger people it is self-confidence or self-control - and being able to see the changes in those students and know that you were a great part of that and to see the improvements in their lives. I look at brand new white belts, and I just get so excited because I know what a wonderful thing the martial arts is going to be for their lives. To me that is the most rewarding thing, to know that I was a help to those people. Looking back on students that I have had since they were perhaps four years old, and seeing them going off to college now, and seeing what responsible young people they have become and know that I have been a part of that. Q: What is your career outside of Tang Soo Do? I am a full-time martial artist. I used to be a controller and worked in accounting for many years. But I retired from that and went full-time when Kwan Jang Nim St. James and I both decided to go full-time to build the school. We opened the school 14 years ago, but 12 years ago was when I decided that martial arts was going to be my career. I have been doing it full-time ever since. We are very blessed. We have students who have been with us this entire time. Q: When you began training in the martial arts, did you have any particular art in mind? How did you discover Tang Soo Do, was it a chance meeting? Originally, I was looking for karate for my children. As a white belt, the style of martial arts was not anything I knew about. I was really looking for the instructor. We happened upon a program at a local fitness center and the master instructor of that program was Kwan Jang Nim St. James. It just seemed like a fit for my family. They were teaching what we wanted our children to learn. You know how it is when you meet someone for the first time, and then when I read some material Kwan Jang Nim had written, I said this feels like the right place for us. These important life issues remain a choice that is person for most people. I was speaking with another martial artist from another school, and we were discussing the names of our schools. They asked me: "Why don't you have Tang Soo Do up on the school sign?" While Tang Soo Do is my passion, I replied that most people in the community don't know what Tang Soo Do is. 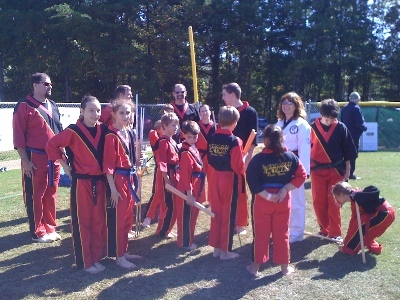 To them, learning martial arts is really about how they feel about the people teaching. Q: You work with many children in the Do Jang. How have the younger students that you train today changed since you began you own training? In many ways, the students are the same. One difference is that we start younger. It used to be that the youngest student we would see were six years old. My own son started as six because this was the earliest age he could begin. Now, we have students as young as three or four. I don't think the students have changed so much as I have! Over time, I have learned to relate to them, and how to encourage them in different ways. As I have been teaching longer, I have learned to bring out more in them. My expectations of them are higher, not because they are any better or worse than students I had ten years ago, but because I have matured as an instructor and know how to bring that out in them. Q: When you look at younger students, knowing how long it takes to gain the skills and earn the black belt, how do we keep the students engaged over the long term? How do we keep the next generation of white belts excited and involved over the time it takes to attain confidence and competency in the martial arts? That's the hard part. My instructor has always said "Inch-by-inch it’s a cinch, yard by yard it's really hard." We try to insure that we have small interim steps along the way. We focus on goals even for three year olds. We try and get them excited. Not just about their long-term goals - which for a three year old is really hard, especially knowing that the black belt is so many years down the road - but for other goals as well. We focus that three year old on becoming a black belt someday. We ask them: "What do you have to do now to become that black belt someday?" The answer is: "Act like a black belt today." So I teach them to act like a black belt - sit like a black belt, walk like a black belt, and to behave like a black belt - and that puts the long-term goal in their mind. In the short term, we can challenge them but not over-challenge them. In other words, we give them a challenge that they have to work for, and that they can become really excited about when they achieve it, but not such a big challenge that they feel it is hopeless. That is a hard balance to achieve and you have to achieve that per child and individually. We have been really successful in doing that. I have students who started with me as four year olds and they are now 17 and still training as third degree black belts. The way we have been able to do this, number one, is by giving them challenges. Number two, by really rewarding want you want to achieve. Number three, have expectations. If a four year old can learn to behave as a black belt, and they achieve more than they ever thought they could, then that will excite them. In addition to this, we have different belts and programs to give them a goal to be looking at, and as long as they always feel like they are moving forward, you have a much better chance of keeping them with you. Q: Tang Soo Do is an art of continual improvement and one which ideally goes on indefinitely. But often we get caught, both mentally and physically, and we plateau or seem unable to advance. What happens when you or your student’s reach an impasse? What is your approach to this common problem of plateau? It is a common problem. Students sometimes develop what we humorously call "Brown Belt-itis." 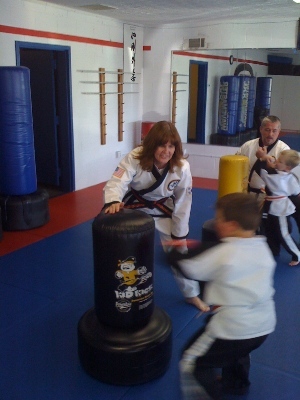 This is a common condition that children develop around the level of brown belt. The next plateau is around the level of Cho Dan Bo. We feel this is normally related to a "fear of failure" or a "fear of testing." Students can have multiple plateaus. We know this in advance and we can prepare for it. The first thing we do is prepare our parents in advance. We tell parents, around this rank you will run into this problem. When you run into this, these are the steps you need to take: Encourage your child. We are going to remind them why they started studying the martial arts. We are going to remind them why they wanted to become a black belt. We will have a private lesson. We are going to give them our own personal experiences and the experiences of other students who have been through the same thing. For instance, for children, I will call in one of my black belt children to a conference because every black belt child has been through the same thing. I'll ask that black belt child "Did you ever want to quit?" 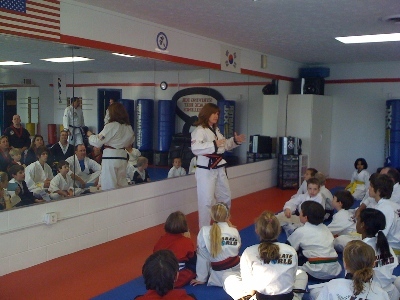 Or I will tell the class, "All black belt children stand up. Now, if you ever wanted to quit stay standing." Every one of them will stay standing if they are honest. Most children have a point that they wanted to quit. Then I will say "If you are happy you didn't quit, stay standing" and they will all stay standing. You never meet a black belt that wishes they had quit years ago, you only meet students who wished they hadn't quit. The best way to work through those plateaus is to anticipate them and to know how to react as soon as you start seeing the symptoms. For me personally, it is tough. It is tough to stay moving forward, especially physically, when you are teaching full-time. I think this is the hardest thing for me; just keeping up with my personal training when I am also instructing. The longer you train, the more mental your training becomes and the more you have to mentally focus on moving forward. If you are not moving forward, you are moving backward and I have to remember that. So I have to do a lot of personal goal-setting. I am very blessed that I am still with my instructor and he and I are partners in this school. So I do have someone else there helping me. I am very blessed that my son is also a fourth degree and about to get his master's promotion next month. So he and I encourage each other. It is all in the people you are around as well as being self-motivated. Q: How do you integrate your Tang Soo Do training and philosophy into your everyday life outside the Do Jang? 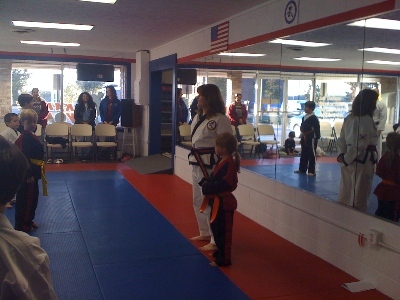 My son was once asked what has changed in your life since you began training in the martial arts. His response was: "I don't remember my life before the martial arts." He was so young when he began training that he doesn't know another life, whereas I do. For me, the martial arts have so enhanced my life. I feel so much better physically and because of this, I have the energy to do what I need to do as an instructor. 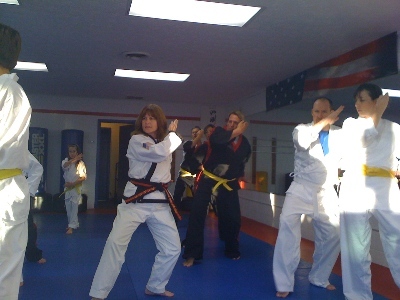 Because I am a full-time instructor, the martial arts are a normal part of my everyday life. It gives me much more patience than I ever had before, so I am able to calm myself if I am frustrated. I use it as a tool to be better self-disciplined. If you need to get something done, you use your martial arts discipline, and you recall how to achieve your goals. You take that same self-discipline and put it in other areas of your life. This has really helped me. I have such a passion for the martial arts that I don't have a job - I have a calling! If you get up and go to your calling everyday, your life is just happier. I am blessed that I do get to go to my calling everyday. So my everyday life is the martial arts. Q: Where do you find the path to growth in your training and practice? Is growth just a matter of simple repetition? For me, it used to be repetition. But as I have gotten older, the hardest thing for me is just having that time to train. As far as growing physically in the martial arts, it is a matter of keeping myself in good condition. I have to repeat things more now than I used to, and I have to try and constantly improve. The one thing that really helps me is knowing that if I am out of shape, then I can't be a good example for my students who are trying to get into shape for testing. It is a matter of constant improvement instead of fighting backward. Q: Getting ready for competitions is obviously a stressful time for all martial artists. To maintain my concentration, I tend to retreat into my own world and start a regime of intense and mostly isolated training. What techniques do you employ to get ready for competitions? Probably more than anything else, I use a lot of visualization. I competed all the way up until master, and at all our events, and the biggest thing for me was visualization and practice. I always tell my students do your form so many times that when your mind goes blank your body just knows what to do. As I explained to them, a lot of times when you get nervous, you don't want to have to think. Then, I remembered that the outcome of the competition wasn't as important as just getting out there, meeting the other people, the camaraderie, and giving it your best. When I kept this in mind, it calmed me and I did much better.